One of the most famous examples of effective statistical data presentation is Charles Joseph Minard’s “Mapping Napoleon’s March.” The chart (below) details the geographical progression of Napoleon Bonaparte’s Russian campaign of 1812, and powerfully communicates to the reader the scale of lives lost over time, space and temperature. The effect is clear. The data, presented in such a way, fully demonstrates how disastrous the campaign was, and how closely that devastation was linked to cold weather. It has taken many an author entire books to get the same point across. But in addition to telling us about lives lost in centuries past, can data presentation be useful for saving lives in the future? Over the last century we have made leaps and bounds in our technological capacity to collect data, but have had less success with presenting it to people who could use it. Let’s take the example of climate data and disaster risk management. Practitioners that are responsible for preventing and responding to disasters often have difficulty using climate data in their work, not necessarily because the data isn’t complete (though it sometimes is), but because it is often times not presented in a way that makes it easy to understand or use, particularly given the local, regional and institutional contexts disaster risk managers are operating in. This failure of communication could mean the difference between lives and deaths. In some cases, disaster risk managers may…decide not to incorporate climate information into their decision-making process even if it is available….disaster managers have historically been exposed to an often-daunting mass of largely unfiltered, irrelevant and even conflicting information. The tragedy of available information not being used to help prepare for disaster, due to the fact that it is not well-organized or well-contextualized, is enormous. It’s the equivalent of a doctor handing a patient reams of x-rays and blood test reference range charts that indicate the presence of a treatable, yet potentially terminable, disease, and not interpreting them. This would, of course, be completely unacceptable. But in cases of climate-related disasters, hundreds, if not hundreds of thousands, of lives are on the line, and the diagnoses are not being properly communicated. In the case of climate data, the difference is that the “presentation” and “interpretation” of data is a skill that neither climate scientists nor disaster risk managers are necessarily trained for. But there’s good news. Effective, user-friendly data presentation can certainly be done, and there exist people and institutions with the ability to do it. 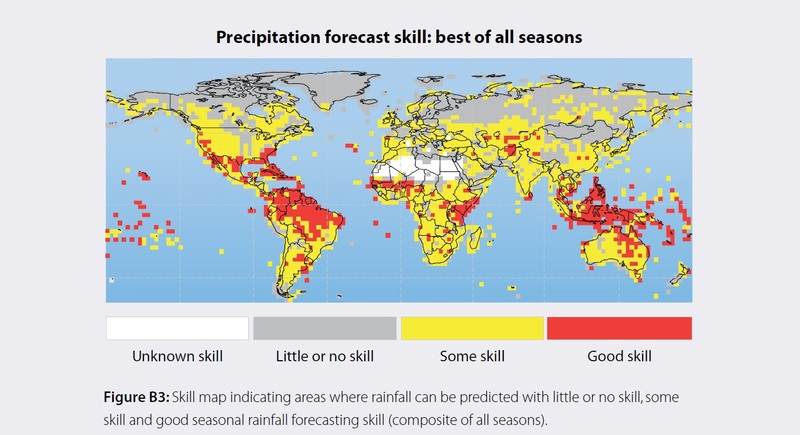 Skill maps provide a quick indication of where seasonal forecasts can be used for early warning…Figure B3 based on IRI’s forecasts since 1997, indicates areas where seasonal forecasts may rarely (‘little or no skill’), sometimes (‘some skill’), or often (‘good skill’) provide useful information about rainfall for the next three months. Based on this information, disaster risk managers can decide whether or not seasonal forecasts are worth monitoring. For instance, in places where there is little to no skill, any shift in the probabilities is likely to be small and early warning opportunities will thus be very limited. If such expert attention can be lavished on the dubious exploits of a maladjusted emperor from the 19th century, surely those that are vulnerable to future climate-related disasters deserve at least the same level of attention? Indeed, expert “data presenters” could very well become the heroes of a climate-uncertain future. By Francesco Femia & Caitlin Werrell in climate change, data, data presentation, disaster, mapping, risk on October 17, 2011 .